The Spouse gold coin was issued by the American government in order to commemorate and honor the first spouses, meaning the spouses of the American Presidents throughout time. These coins have been issued since 2007, when also the coin displayed on our website was minted. Starting with 2007, every year there are issued 4 gold coins featuring four different spouses. Until now, the minting program is only announced until the year 2016. The idea for these coins honoring the spouses came when the US government started minting the $1 gold coin that commemorates the Presidents. The Spouse gold coin is even issued when the respective President had no wife. In this case, on the obverse is engraved the Liberty image, which is also present on the American Eagle gold coin. Each Spouse gold coin has the same characteristics, which are quite impressive for any investor or collector. It weighs exactly 1/2 oz. (troy ounces) of pure gold. Otherwise expressed, each coin has 24 carats fineness or 99.99% purity and weighs 15.50 grams of pure gold. The Spouse gold coin has a diameter equal to that of the $1 Presidents coin. The obverse of the Spouse gold coin depicts the portrait of an older Abigail Adams who was the spouse of the second President of the United States and also the mother of the sixth President. At the top of the coin is inscribed the name of the spouse ABIGAIL ADAMS. The legend also reads IN GOD WE TRUST and LIBERTY 2007. At the bottom of the coin is inscribed 2nd, meaning the spouse number and 1797-1801. The reverse of the Spouse gold coin presents a special image which should be representative for the activity and what defined that respective President spouse. 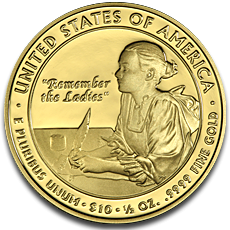 In the case of Abigail Adams it is illustrated a portrait of her while writing letters to her husband with the inscription “Remember the Ladies”, which are her famous words. These letters served historians to understand the revolutionary times from that decade. The inscriptions are: UNITED STATES OF AMERICA, E PLURIBUS UNUM, the denomination $10, the weight 1/2 OZ., and the purity .9999 FINE GOLD. Being the first series that comprises legal tender gold coins that feature women in a consecutive manner of issuing, the Spouse gold coin entire collection presents itself as a great opportunity for collectors. The idea related to these coins is unique which makes it a much desired collection. The Spouse gold coin is a remembrance of the fact that any great man must have besides a great woman. Investors, having an analytical view, will see in the Spouse gold coin an opportunity to own a valuable coin that has 99.99% purity and weighs 1/2 oz. pure gold. They foresee the possibility of being profitable in the future from the trading of one coin with these characteristics. Another factor that spikes the interest for the Spouse gold coin is its scarce mintage amounting to only 40,000 gold coins per year. These 40,000 gold coins are the total for all the four designs bearing different spouses every year. By a simple calculation it will mean that each Spouse gold coin is issued in only 10,000 gold coins proof and uncirculated, however, momentarily this is not a worry because we have this American 1/2 oz. gold coin available on our website.